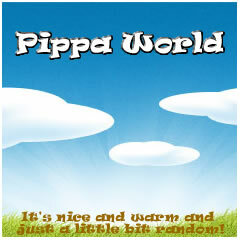 Pippa World: Celebration or Sadness? Today is the anniversary of my Gran's death. It is also Top Ender's birthday. I know I have talked about this before but I feel that it was just so unfair for Top Ender's day to always be shadowed by the death of a beloved relative. I told Top Ender that my Gran chose this day so that she would always be linked to her. That she wouldn't of wanted us to be sad, but to be glad for her life, for the love that she had shared and that of course now she is with her own parents and husband in heaven and that is why she died after Top Ender had gone to bed and her birthday was "over". I can't help but feel that is a load of crap though. If my Gran wasn't dead I could kill her for dying today. I mean I know it wasn't her choice, I know that her body just gave up and I understand that I do. It's just wrong and unfair. Someone made a comment about a year after her death on a blog post of mine about how I hadn't stopped talking about her in the year since she had died. It made me upset, I didn't want to be filling AMR with mentions of death because I didn't want my children to look back and think that is all I was talking about but it was a HUGE event in my life. I wish now I had handled it better and told the person who left the comment to shut up but it's too late for that now. So today after Top Ender has gone to bed and enjoyed her Eighth birthday I'm going to go to bed and have a cry in to my pillow about a wonderful woman who left us behind on a special day. Oh Pip that's so sad.My dad had a huge heart attack 3 days after Mia was born.I cursed him for taking the limelight away from her birth because he ended up having a huge operation.Of course I don't think that now. I know what you mean, it's hard because all I want to do is be sad, but it's a joyful day. Stupid death and life.